Hawaii, the fiftieth and most recently added American state, is many people’s idea of paradise. The Pacific archipelago’s islands all have distinct personalities, yet all of them bring to mind turquoise waters lapping against white sand beaches, giant lava-spewing volcanoes, and a relaxed, laid-back culture that many of us can only dream of. Hawaii is not a regular holiday destination, and it has an adventurous side too. You should make your trip to the tropical archipelago extra special by considering getting an aerial view of the islands from a helicopter. This is a once in a lifetime experience and is bound to be absolutely unforgettable. But how on earth do you choose the right one? 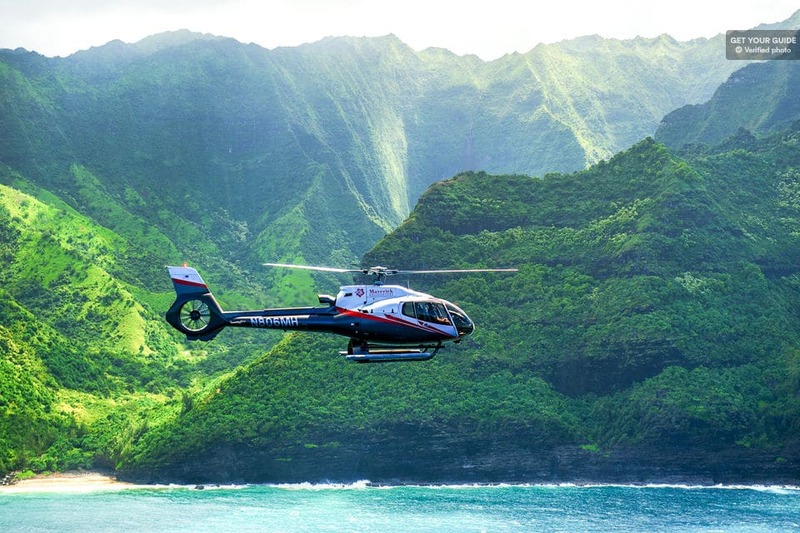 Well, we’ve put together this list to help you choose the flight for you and tick seeing Hawaii by helicopter off your bucket list. 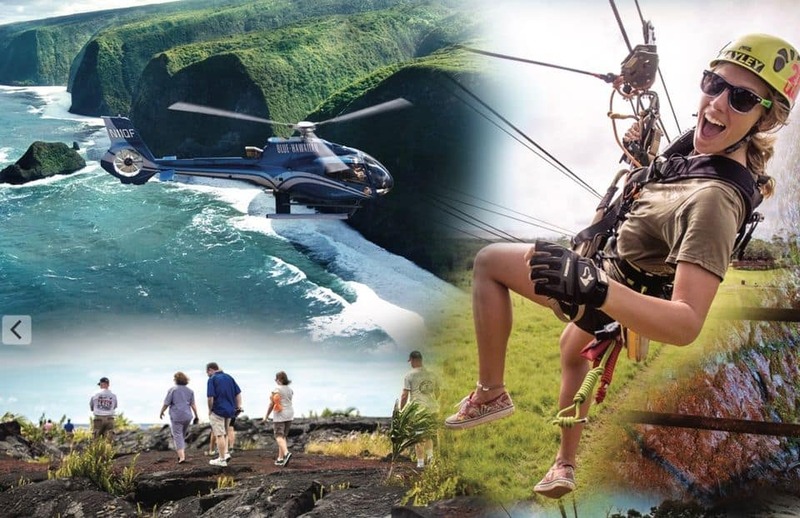 A perfect experience of Big Island for those with an adventurous side, this eight-hour guided tour incorporates helicoptering, ziplining, and a delicious picnic lunch, all in the jaw-dropping Volcanoes National Park. In the morning, you’ll soar through lush green jungle on the longest zip line in a Hawaii. After that, it’s the highlight of the day; watch the jungle give way to black lava as you soar over the active Kilauea volcano. You’ll also see the rainbow waterfalls, before dinner at a winery. Watch the sunset within the national park before you are whisked back to your hotel. 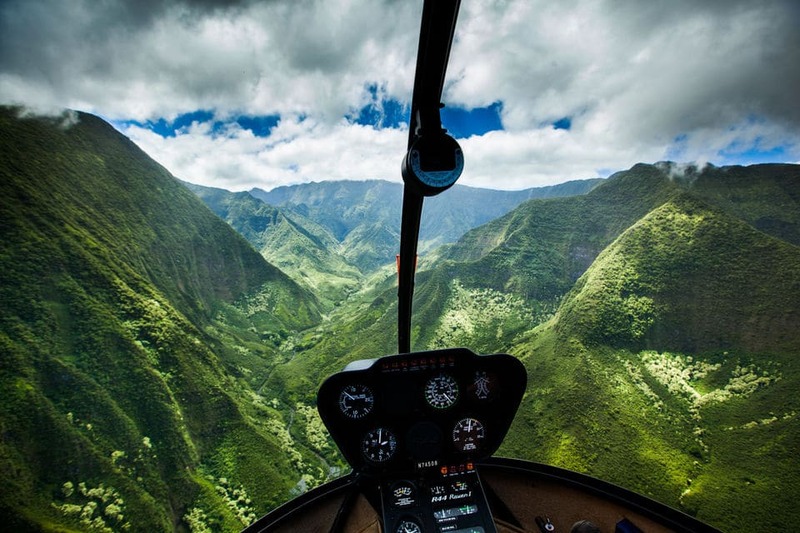 Get yourself to Kahului airport on Maui before taking to the skies for this experience of a lifetime, which will see you ride for just over an hour over the “Valley Isle.” You’ll do a complete circle of Hawaii’s second largest island, taking in its tranquil beauty. 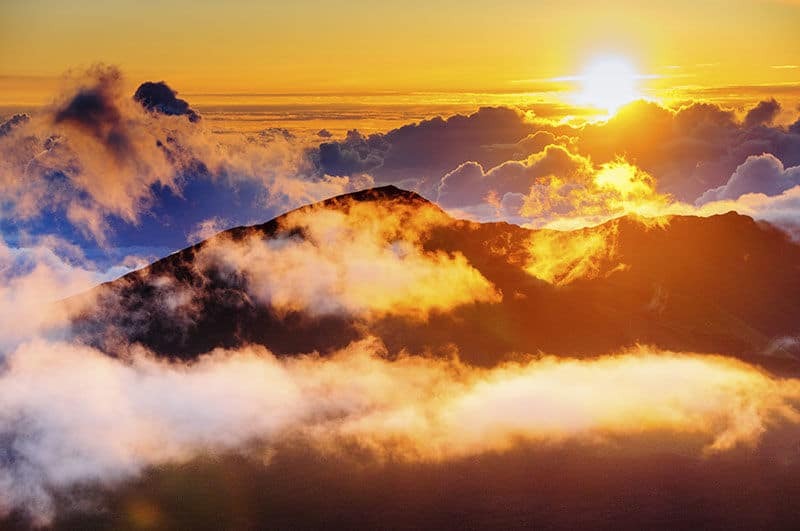 During the 65-minute flight, you’ll see hidden valleys in the West Maui Mountains, the tropical green Hana rainforest landscapes, and the volcanic crater of Haleakala National Park – all of this surrounded by the uninterrupted blue of the Pacific Ocean. Don’t forget your camera, as you’re sure to get some breath-taking shots. This 55-minute tour takes in not just one, but two of Hawaii’s magnificent islands: Maui and Molokai. 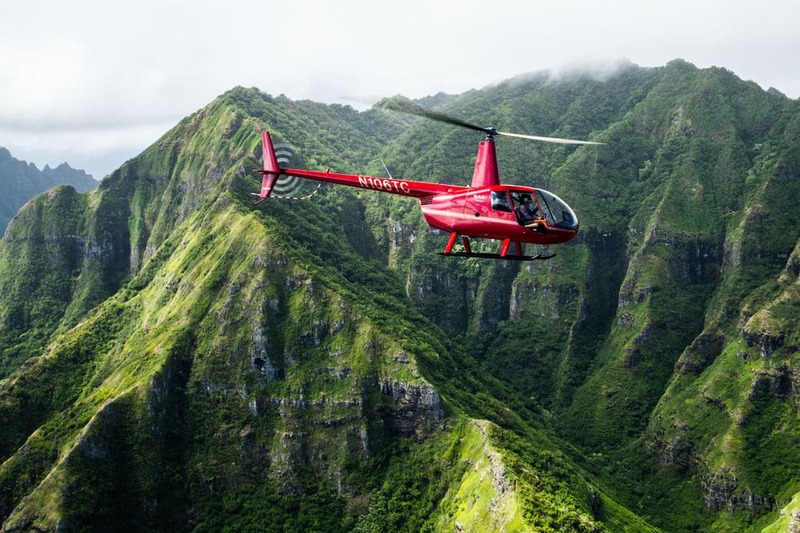 Starting at Kahului airport on Maui, your flight will begin by taking you over the world’s largest sea cliffs before seeing some of the most formidable waterfalls on Molokai. The in-flight commentary will tell you exactly where you are; whether it’s the huge fish ponds or Elephant Rock. In the second half of the flight, when flying over Maui, you’ll get great views of the island’s tallest waterfall and the West Maui mountains. If you’re really lucky, you’ll even see the Wall of Tears waterfall, weather permitting. This Maui tour focuses specifically on the eastern part of the island. 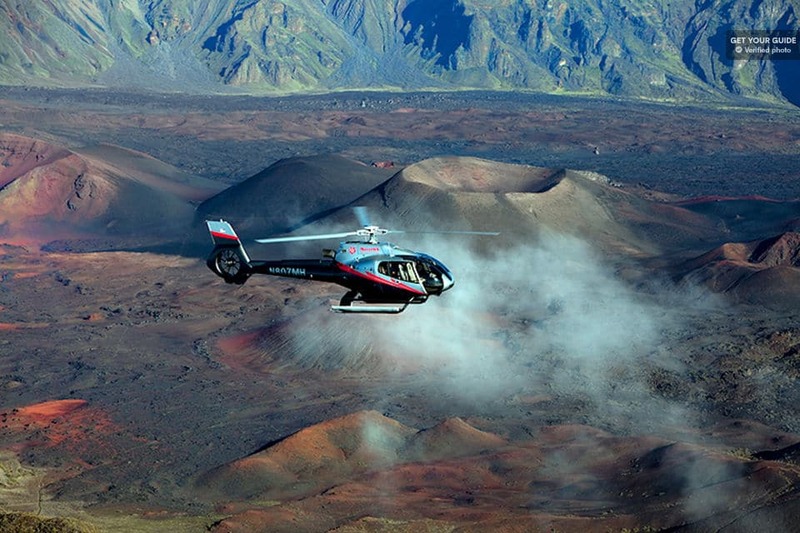 Feel a rush of excitement as you leave Kahului heliport and head towards Haleakala National Park. Peer down into the crater of the world’s largest dormant volcano before being whisked off over the Hana rainforest. Other highlights of the trip include Maui’s incomparable coastline, Old Hana Town, and the Manawainui valley. In winter, those with especially good eyesight may even be able to pick out humpback whales in the blue of the Pacific Ocean. Can’t decide which island you want to see at sunset? Then this is the tour for you. Not only will you fly over Maui, but in just 40 minutes, you’ll also fly over Molokai and Lanai. 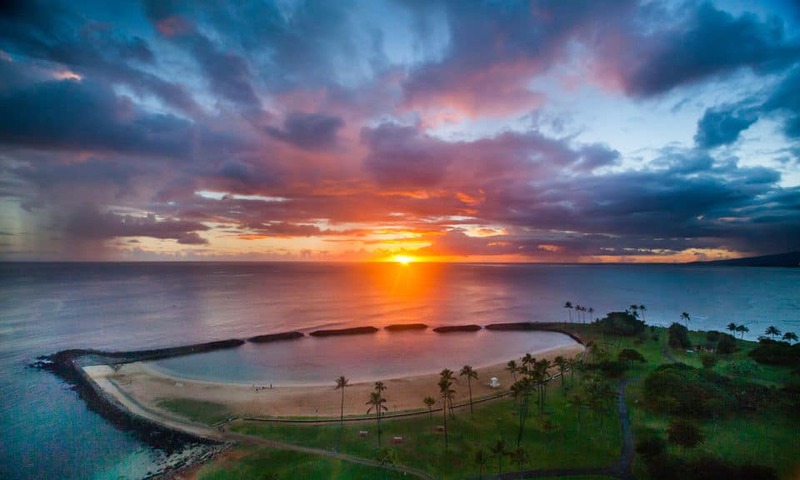 This dusk tour will take in some of the top attractions from each island, including Molokai’s ancient fish ponds, Lanai’s shipwreck beach – where you can still feast your eyes upon a stranded US World War II ship – and Maui’s Molokini crater. There’s no chance of you tearing your eyes away when you’re over the water either; you’ll pass over Elephant Rock and the clear waters of the Pailolo Channel. This helicopter tour is more than just a flight where you can gawp at the jaw-dropping landscapes before you. 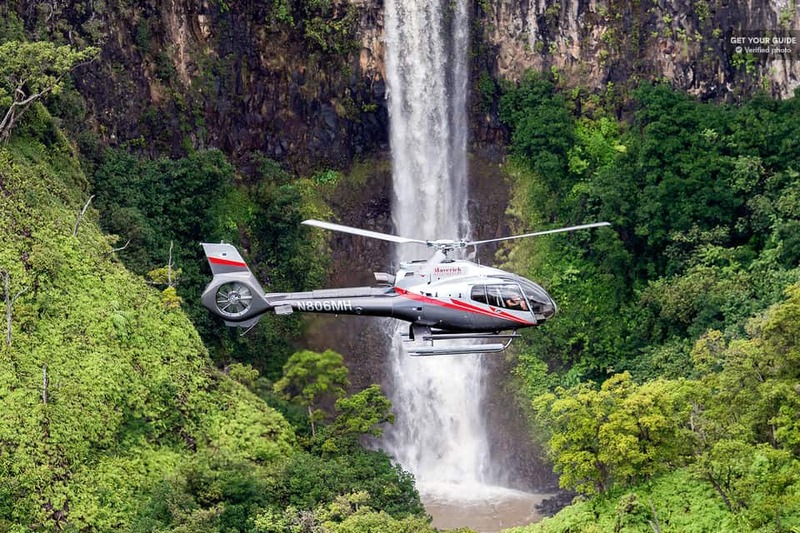 The 75-minute Hana Rainforest Helicopter Tour actually lets you land in the Wailua Valley, where you’ll explore what used to be a taro plantation. A delightful 40-minute round-trip flight will get you acquainted with enormous sea cliffs, roads cutting deep into the rainforest, and even the world-famous Jurassic Rock. Thirty minutes on the ground may not sound like a lot, but it’s enough to find out from your pilot about the remote Hawaiian landscape – home to crops like as coconut and banana. 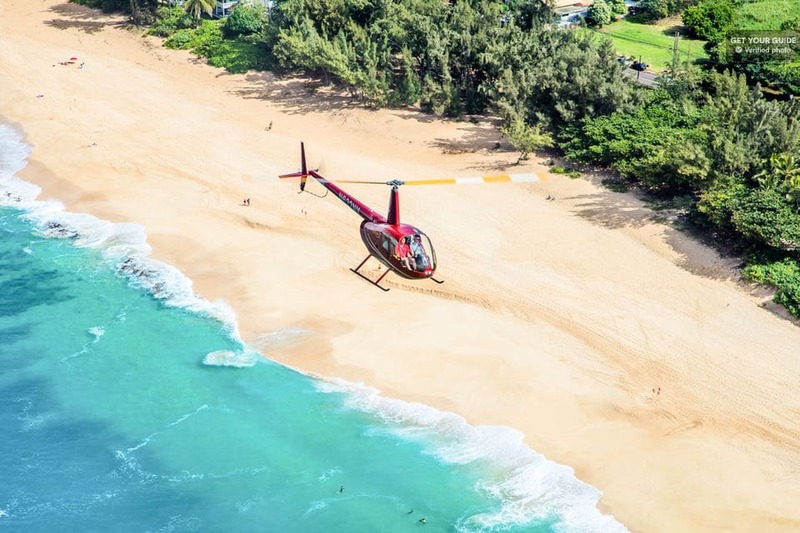 Take away the stress of getting to and from the heliport by enjoying round-trip transportation from your hotel to the chopper that will give you magnificent views of Oahu. 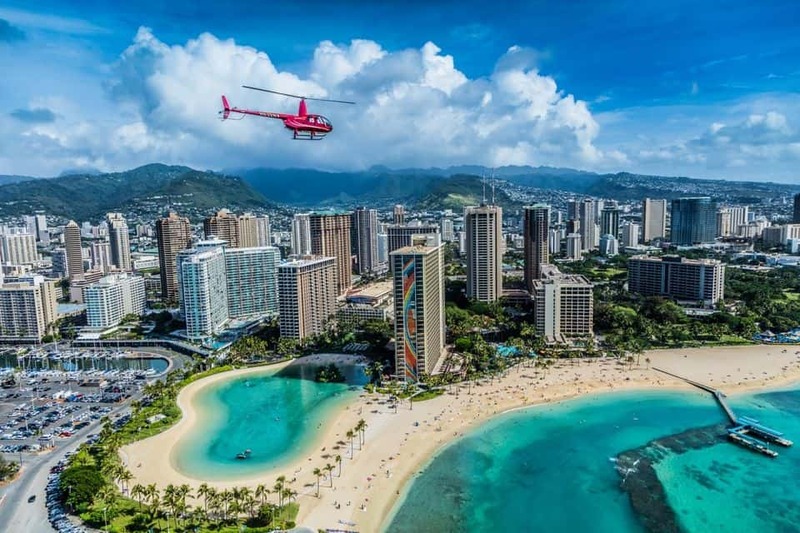 Choose whether you want the doors of your chopper on or off before ascending above the famous Waikiki skyline and taking in the best that Oahu has to offer. Volcanic cliffs, coral reefs, and a massive engineering marvel of a lighthouse are just a few of the spectacles you’ll be treated to on this trip. The tour ends on a sobering note as you pass over Pearl Harbour. Fireworks are great from the ground, but how many people can say they’ve seen them at eye level? Well, anyone who’s been on this tour, for one. Get picked up from your hotel and strap in your phone so you can take incredible photos of fireworks as you’ve never seen them before. Your flight begins at sunset, where see the last rays reflecting on the pristine waters of the South Shore. As the skies turn black, watch the weekly fireworks show from the Hilton Hawaiian village, coloring the beaches and waters below. Your tour will wrap up when you fly over the USS Arizona Memorial. 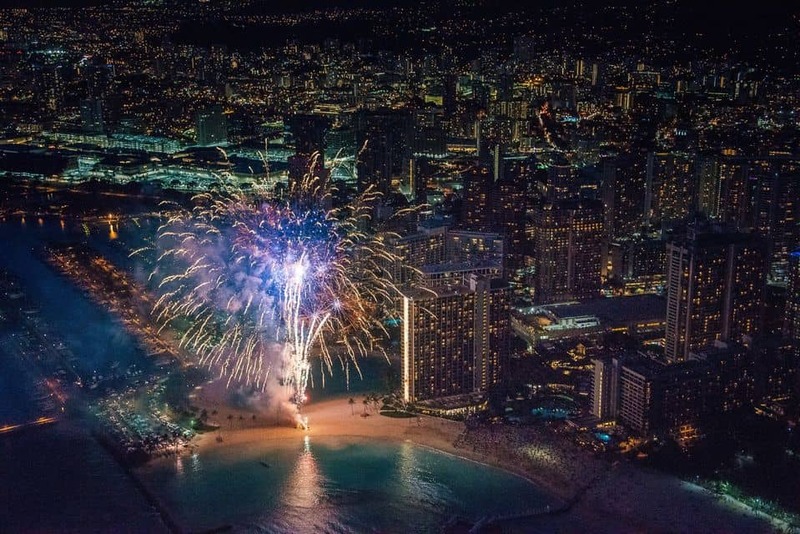 You’ll never see Waikiki in the same way again after you fly over it in a chopper. Spot sunbathers and surfers as you soar out of Honolulu harbor, before passing over the pristine white sands of Waikiki Beach. A friendly and knowledgeable guide will be on hand with live commentary, pointing out other iconic sites such as Diamond Head and Punchbowl Crater. Your tour winds down by flying over the USS Arizona; your guide is sure to give you more of a background into the poignant events that led up to the destruction of Pearl Harbour. What’s better than seeing Honolulu city by night? 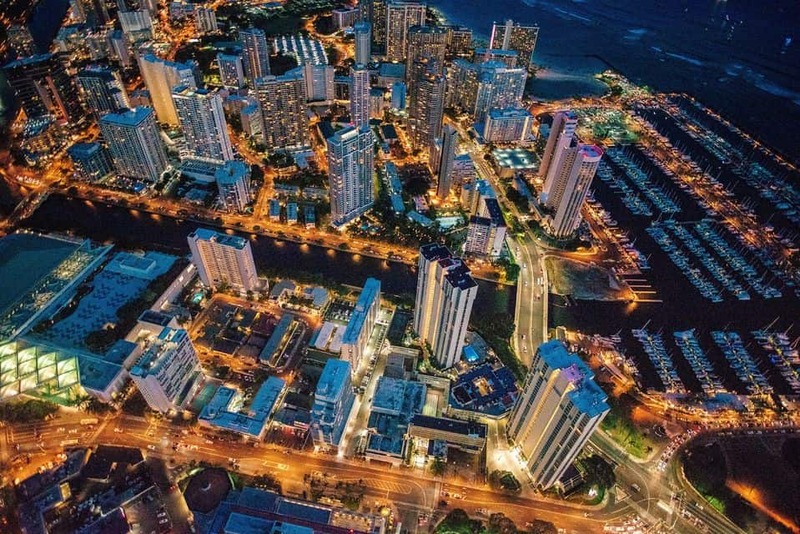 How about seeing Honolulu City by night from a helicopter? Spend your day enjoying the city’s charms before being picked up from your hotel, full of anticipation for your flight. You’ll have jaw-dropping panoramic views of the city skyline, as you see how the lights from the skyscrapers color the sand and sea, giving it an eerie and ethereal glow. You’ll pass over the city harbor, Honolulu Tower, and the Ala Moana center, before seeing the beautifully lit Pearl Harbour and USS Arizona memorial. A great flight if it’s your first time, 20 minutes should be enough for you to feel the thrill of flying in a helicopter. You’ll be accompanied by a guide who will tell you all you need to know about the sites you have a bird’s eye view of, as the vibrant colors of a sunset in paradise merge into one. See Diamond Head and the Waikiki skyline bathed in orange, pink, red, and a host of other colors, before descending via the moving USS Arizona memorial. 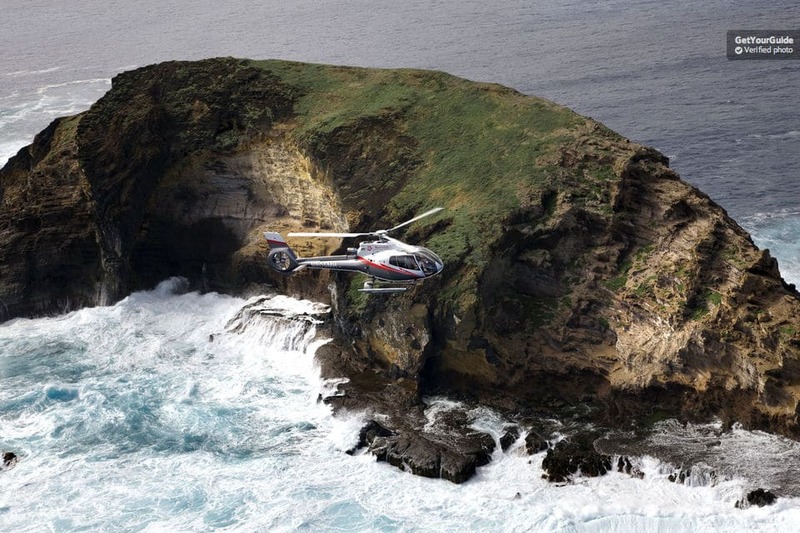 This short flight is bound to whet your appetite for another helicopter trip. For those who have spent a lot of time in the city, this is a great opportunity to get to know the more remote parts of Oahu Island. You’ll fly over all of the big-ticket attractions mentioned in other Oahu tours on this page, but this one has a bit of a difference as it’s very nature focused. Travel up the coast and marvel at the spectacular Manalua Bay, one of the island’s many coral reefs, the Windward Coast, and Lanikai Beach. 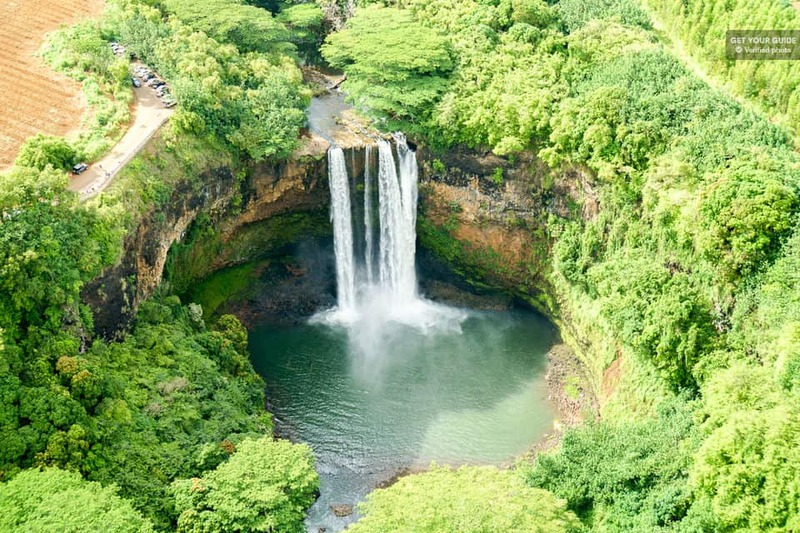 Before heading back to Waikiki, you’ll see the full range of the diversity of Oahuan landscapes, as you look down on the Ka’a’awa valley and the Sacred Falls. After this exhilarating flight, you’ll be taken back to your hotel in comfortable, private transport. On this half-hour tour, you’ll be picked up from your hotel and taken to the island’s South Shore, where your friendly guide will accompany you into your helicopter and take to the skies. After flying out of the city, you’ll get a bird’s eye view of the natural wonder of Diamond Head before heading up one of the world’s most picturesque coastlines, the Windward Coast. Your tour will then turn inland, giving you a glimpse of the splendid Mount Olomana and the precipitous Nu’uani cliffs. This tour is a perfect blend of Oahu’s most precious natural and man-made sights. Maui may be the “Valley Isle,” but smaller Kauai is known as the “Garden Isle,” and this 25-minute tour is a great way to learn how it got that name. Get yourself to Port Allen Airport, where you’ll be met by the guide who’ll provide your in-flight commentary. Most of Western Kauai’s natural wonders are inaccessible from the ground, making this tour a no-brainer. 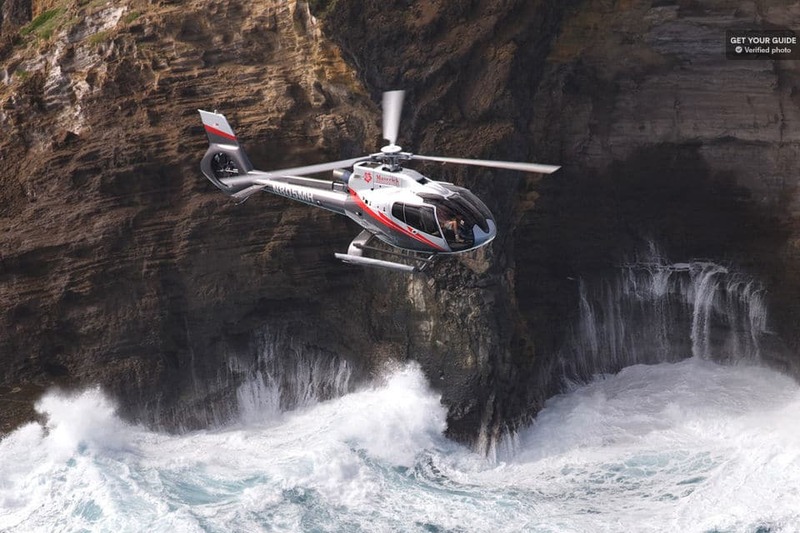 Fly through the Grand Canyon of the Pacific – Waimea Canyon – as well as seeing the Manawaiopuna falls, which had a starring role in the film Jurassic Park, before heading back to land via the farmlands and mountains of the Hanapepe Valley. This tour, lasting almost an hour, leaves from Port Allen airport and really shows you the best that Kauai has to offer. The island’s most famous landmarks, Waimea Bay and the Na Pali coast, are the focal points of this trip. Na Pali’s jagged emerald cliffs seem to drop into the sparkling blue waters of the Pacific Ocean along the 17-mile stretch. You’ll then head inland to the desert landscapes of the Waimea Canyon. Not only will you see the two top landmarks, but you’ll also see several settings from the Jurassic Park films, as well as Mount Makana and one of the world’s wettest places – Mount Waialeale’s tropical rainforest. This is the perfect trip if you want to see the best of Kauai from the air.